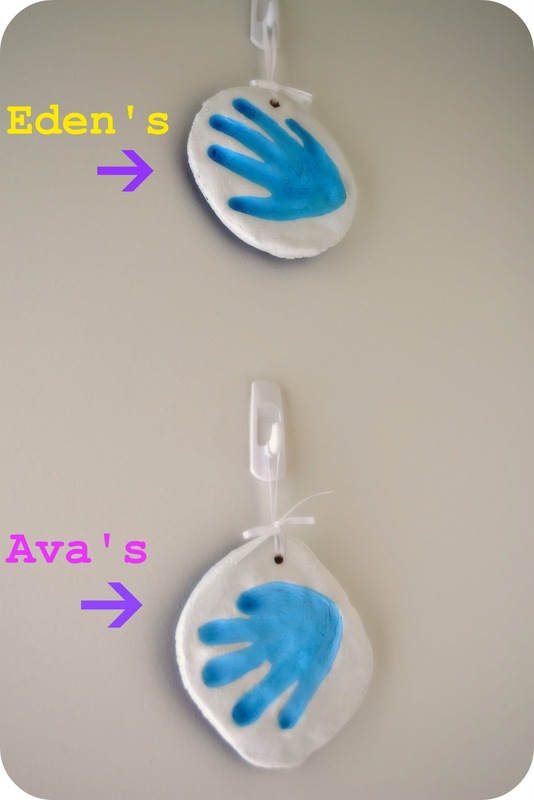 Initially I was going to make Christmas ornaments with my girl's handprints on them, but as we made them I realised that I wanted to see these keepsakes every day, so they now have a permanent spot in our bedroom. They would make a nice gift for grandparents too, if you're so inclined. I simply made up a batch of cornstarch clay with Eden's help (see here for the recipe), divided the clay into portions, and rolled it out nice and evenly. Eden and Ava 'smushed' (E's words, not mine) their hands into the clay to leave an imprint. Once they were in bed, I went back and smoothed the imprints out a little - Ava had dug her fingers in, so hers actually had holes in it! I filled it in and smoothed it out, but retained the shape of her hand. I also tidied up the edges of the shapes - Eden's is on a circle, Ava's is on a square with rounded edges - and poked a hole in the top of each shape using a straw (this is for threading some ribbon through later, so you can hang it up). I have also used the cornstarch clay in the past to make Christmas ornaments (just roll it out, use Christmas cookie cutters to cut out shapes, bake, and have your child paint them), and beads for threading (roll into a log, cut into pieces, punch holes in the 'beads' with a straw, then bake and paint! ), and there are heaps of other ways to use it too. If you try it out, please post what you've done in the comments section below, so we can all get some inspiration. Thanks! ~L. I need to do something like this with my girls... It's such a neat keepsake and it's so neat that you made this out of cornstarch!!! 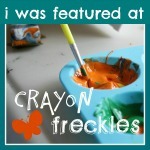 Thanks for sharing this with us at Sharing Saturday. Thanks Mia, my parents actually used to make Christmas ornaments with me when I was a littlie using this cornstarch clay, so I was really familiar with it. Eden and I have also used it to make Chrissy ornaments ourselves. It's so user-friendly!